Despite the bulky look, most users say that the shoe doesn’t feel clunky during play. Many say that the transition from heel to toe is great. Several wearers report that the shoe brings the foot very close to the ground. One tester comments that the Adidas Crazy 8 takes damage really well, as it doesn't peel and the creases do well to give the shoe character. Reviewers mention that they did not experience any slippage within the shoe as long as they went true to size. Majority of the buyers say that the materials on the shoe are very high quality and durable. A lot of users commend Crazy 8’s stability, which might be due to the wide base of the midsole and the general shape of the shoe. Many players who use the shoe notice that the foam cages of the midsole hold the foot down really well. Although the shoe is quite structured, some users also observe that the shoe is quite flexible; saying that the peaks on the midsole are actually flex points. Because of the shoe’s minimalist lacing system, one tester appreciates how easy it is to lock his foot down. These Kobe Bryant sneakers nearly mimics the lacing system of the 11th AJ shoe but widely spaced. Majority of the people who purchased the Adidas Crazy 8 state that the reason they bought the shoe was due to style; saying that they love the colors and the shape of the shoe. Some reviewers are pleasantly surprised that they did not experience any pain or aches after playing in the shoes for a couple of hours. A lot of users say that the cushion is stiff right off the box, but the foam softens after a few plays. Many users comment that the Crazy 8 does not have enough lockdown since eyelets don't go up to the top of the ankle collar. Two testers recommend the use of the nylon straps on the collar as additional lace loops. Majority of the testers remark that the herringbone pattern on the outsole does not have any protrusions that increase friction, which we see commonly in today’s shoe models. A couple of reviewers say that they experienced pinching in the lateral side of the forefoot before they’ve broken the shoe in. People who are narrow-footed do not appreciate the fit on the forefoot, saying that the forefoot of the shoe runs a bit wide. Despite the crazy look of the Adidas Crazy 8, the shoe is one of the most worn retros in the league. Released almost 20 years ago, its design was one of its kind and still proves to answer the needs of players today. If you need a stable, supportive shoe that is low-to-the-ground, has excellent impact protection and is very durable, then this is the shoe for you. Get these, they are pretty nice. Despite the overall 7.1 score, these are highly recommended in my personal opinion. Those who remember the KB8, will appreciate Adidas reissuing one of the best performance basketball shoes ever made. Those who have not experienced the Crazy 8 are in for a treat. The Adidas Crazy 8 is not only a solid performance shoe but also a nostalgic one. Debuting in 1998 and previously known as the Kobe 8, the shoe garnered a huge following because of its futuristic look and its ability to perform on-court. Not to mention, it was worn by the young Kobe Bryant, on his way to claiming his fame. Fast forward two decades, Kobe Bryant is now happy with the recently re-released Zoom Kobe 1 Protro with Nike. Cushion. The shoe uses an EVA cushioning for its midsole. Despite its bulky look, the midsole is thin and sits very low to the ground. The rounded edges of the midsole were designed to encourage agility with every step. Included with the Crazy 8 is a PU insole that adds impact protection. Traction. The Crazy 8 has a flat herringbone pattern on the forefoot and the heel. The grooves are very close to each other. The outsole is made of solid rubber and can be used both indoors and outdoors. Length and Width. Adidas Crazy 8 is true to size both in length and width. Upon purchase, you can go with your regular Adidas basketball shoe size. Lockdown. Together with the EVA cage on the sides of the shoe, the Crazy 8 features a strap-like design on the upper that hugs the foot when the laces are tightened. Two nylon straps are attached to the base of the heel and ends at the tip of the ankle collar. These straps can be used as lace eyelets. When threaded with laces, the shoe collar cuffs the top of the ankle and locks the heel into place. The shoe also uses a minimalist lacing system, which makes getting into the shoe an easier task. The Adidas Crazy 8, depending on the release and colorway, uses a mix of materials on the upper. But most commonly, they use full-grain and patent leather on the upper. The tongue and collar are padded with foam. There are no perforations on the tongue or any mesh material on the upper. Thus, ventilation is very minimal, which is the standard for the shoes at that time. The midsole, including the peaks that extend to the sides of the foot, is made of compression molded EVA foam. The insole insert is made of polyurethane. 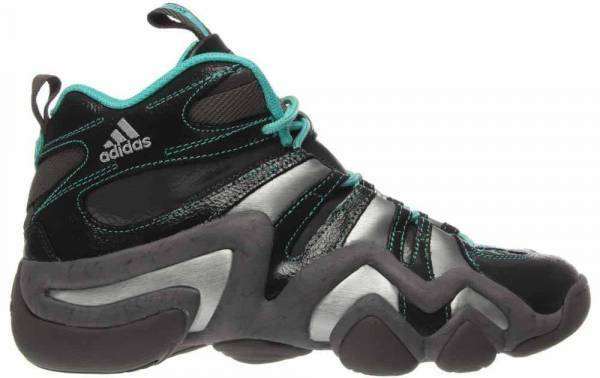 A rigid guide called the Adidas Torsion System is housed in the midfoot. It is made of a sturdy plastic that helps you flex your feet correctly and gives that needed foot support. Lastly, the outsole is made of solid rubber. The Adidas Crazy 8 mixes loud, aesthetic statements with functionality, starting with the bold peaking lines on both sides of the shoe. These lines support the shoe material as the foot flexes. While two nylon straps add texture to the ankle collar, they also act as lace loops that secure the foot in place. The company’s signature 3 stripes are integrated to the sides of the strap-like upper. The stripes are usually made of a different material to contrast them with the rest of the shoe’s upper. The Adidas Equipment logo is found on the tongue, both sides of the ankle collar, on top of the heel, and on top of the toe box. Also, a number 8 is stitched to the base of the tongue, signifying Kobe Bryant’s jersey number when he played with the LA Lakers in 1998. The Adidas Crazy 8, previously known as the Kobe 8 or KB8, was released in 1998. At that time, Kobe Bryant was two years into the NBA and his 6-year Adidas contract. The Crazy 8 was Bryant’s first signature shoe with the German shoe company. His fame was still on the rise, and Adidas made the right call signing with him, even before he was known. The unique silhouette of the shoe featured the Feet You Wear technology, which has this as its battle cry: “Your foot is not flat, so why should your shoes be?“ The shape was intended to mimic the natural contours of the feet so that the shoe would act as a protective, durable, and responsive extension of the foot. The name Kobe 8, however, was changed to Crazy 8 when the shoe was re-released. During that time, Bryant was no longer with Adidas. This quickstrike release is a nod to the original colorway Bryant wore during the 1998 All-Star Game. The Adidas Crazy 8 ‘1998 All-Star” comes in the OG black and white with purple accents. Bryant’s previous jersey number (8) is embroidered on the tongue. Released as part of Adidas’ 2014 All-Star Collection, the Adidas Crazy 8 ‘All-Star’ features an orange-based upper with lime green and blue paint splatter accents. To greet the 2016 All-Star Weekend, Adidas launched the Crazy 8 ‘Aurora Borealis.’ These basketball sneakers are covered in shades of purple, blue, and pink. A gradient look is applied across the upper. This pair boasts a black canvas upper with white accents. A translucent blue outsole completes the silhouette. Adidas’ 2015 Black History Collection pays tribute to the legendary career of Kareem Abdul-Jabbar. These basketball shoes are covered in three shades of brown. Kareem’s face and number 33 are displayed on the tongue while inspirational quotes are printed all over the midsole. This edition of the Crazy 8 aims to help raise awareness against breast cancer. The Adidas Crazy 8 ‘Breast Cancer Awareness’ boasts a pink leather upper with white accents. The Adidas Crazy 8 ‘Mutombo’ incorporates elements from the Adidas Mutombo. These basketball shoes feature a black suede upper with hits of yellow and red. Completing theme is a unique print that runs along the midsole. The Adidas Crazy 8 ‘Draft Day’ is a nod to the original team that drafted Kobe Bryant. During the 1996 NBA draft, Bryant was selected 13th overall by the Charlotte Hornets. Right after drafting Bryant, the Hornets agreed to send him to the Los Angeles Lakers in exchange for Vlade Divac. The Crazy 8 ‘Draft Day’ features a combination of turquoise, purple, and white to replicate the Hornet’s colors. Part of the EQT lineup, the Adidas Crazy 8 ‘EQT’ features a green and white color scheme with plum accents. This special edition basketball shoe features a black-based upper with vivid berry and slime green accents. “I <3 Mom” is written on the insole as a tribute to all mothers. The Adidas Crazy 8 ‘Neon Tribal’ sports a white tumbled leather upper with a unique tribal print along the midsole’s interior. A black speckled midsole adds some contrast and finishes off the silhouette. For the 2015 Holloween festivities, Adidas decided to introduce a new theme called the “Night of the Ballin’ Dead.” The collection includes a version of the Crazy 8 covered in a vibrant shade of pink with hints of purple on the laces and inner lining. To complete the spooky theme, designers included a subtle brain graphic along the upper, crossbones on the tongue, a slimed Adidas logo, and a glow-in-the-dark outsole. Adidas brought back the “Nightmare Before Christmas” theme for the 2013 Holidays. These Adidas basketball shoes feature a purple-based upper with glow-in-the-dark accents and outsole. Dubbed ‘Olympic Rings,’ this Olympics-inspired release features a white-based upper with black, green, blue, yellow, and red highlights. To several NBA stars including Derrick Rose, John Wall, and Damian Lillard, Kareem Abdul-Jabbar represents “the blueprint” for greatness. The Adidas Crazy 8 ‘The Blueprint’ is dedicated to Kareem and takes inspiration from his days in UCLA where he finished his college career with an 88-2 win-loss record, three NCAA championships, and numerous accolades. This limited edition colorway boasts a synthetic suede upper treated in blue with a graphic paper print on the midsole. Other details include a personalized tongue patch featuring Kareem’s legendary hook-shot, his signature on the ankle collar, and his number 33 on the base of the tongue. Dressed in all-red, white, and blue, the USA Pack features three pairs of Adidas Crazy 8 in monochromatic hues. Each pair is constructed with faux snakeskin leather. The Adidas Kobe Vino Pack commemorates Bryant’s tenure with the brand and also bids the Black Mamba goodbye as he says farewell to the game that he loves. The Kobe Vino Pack features cork-like designs as a reference to Bryant’s “Vino” nickname from 2013. The pack includes the Adidas Crazy 8, Adidas Crazy 1, Adidas Crazy 97, and Adidas Top Ten 2000.